For more information contact Dr. Wolfgang Schneider, Museum der Stadt Gladbeck (Gladbeck, Germany). This page shows the five works shown by Roman. 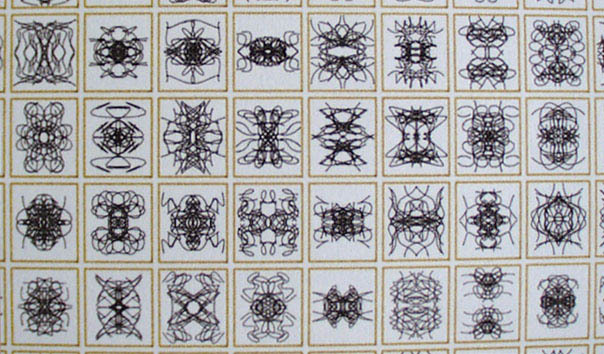 These were chosen to represent several phases in the evolution of his algorithmic pen plotted work. Original pen plotted drawing on rag paper. One of a series of brush strokes begun in 1993. These strokes achieve spontaneous qualities using coded procedures. The software generates a brush stroke which, in turn, is executed with a brush mounted on the pen stall of a pen plotter. This work embodies a form of "computer automatism" that interested the artist from the beginnings of his algorithmic art. Clusters of pen strokes center around the "control points" that initiated the stroke. Each stroke echoes the controller so a self similarity permeates the whole. This work employs routines used in the artist's earliest pen plotted works. The procedures grew from his Magic Hand of Chance (1982-85). The origins of these software procedures may be found in abstract expressionism and earlier forms of 20th Century automatism. The artist's own prototypes are found in his work at St. Vincent Archabbey (Latrobe, Pa.) dating from 1963-68. This work was algorithmically derived from a single set of randomly cast control points. This includes the central figure, that appears more severely geometrical, and also the text-like characters. This work represents the artist's interest in the highly contrasting forms created from the same generator. The text-like characters were executed with a self-inking Sumi brush mounted on the plotter. Gold leaf by hand. Paper Size: 42' BY 30"
Original pen plotted drawing on hot pressed Arches. This version of a Universal Turing Machine (UTM) is quoted from Roger Penrose' The Emperor's New Mind (Chapter 2) and consists of 5,495 binary digits. These digits represent an algorithm, in expanded binary, for a UTM. This algorithm holds a special place in the history of computing machinery since all general computers are Universal Turing Machines. In the tradition of illuminated sacred texts this algorithm is presented as a valued authoritative text of our times. The pen plotted form enhancements, generated with the artist's code, require the logic of a UTM for execution, thus being a form of "Turing on Turing"! Click here for detail (79kb). This series, celebrating 2000 years, has been executed in several versions. Each version presents a unique sequence of two thousand improvisations individually drawn with pen and ink, line for line, without any repetitions. The two thousand improvisations are achieved with algorithmic procedures operating randomly within pre-set parameters. There are no repetitions and each work within the series displays a unique set of pen drawn improvisations. The drawings for each version are penned with one color and framed with a rectangle drawn with another color.